Do Stigmas and Stereotypes Keep You From Working Out in a Gym? When I began my new lifestyle years ago, I had to face the fact that I needed to partake in some form of exercise in order to lose weight. This is something that I did not want to do, due to the fact that I was morbidly obese and the word “exercise” meant working out at a gym. There was no way that this 300-pound mother of three was going to be seen at a gym with all those size 3 fitness fanatics in spandex. I had been judged by my weight and appearance for more than two decades and I was not ready to go through that all again. Not being accepted by my peers was not something I wanted to have to deal with in my thirties — it was difficult enough during my teenage years. OK, so I never actually stepped foot in one of these facilities, so I didn’t know whether my idea about what the women who worked out there looked like was correct or not. I just assumed that all gyms consisted of model-like figures who strived to be thinner and wore designer apparel to show off their bodies that were already in amazing shape. This was the very last kind of place that I would have ever wanted to visit or even attempt to work out in. And I wouldn’t have been able to afford it anyways, since I was a stay-at-home mom and our budget was stretched to the max as it was. I’m very content that my choice of exercise was walking 1½ miles daily, which worked wonders and helped me lose the weight in 16 months. But I can’t help but wonder… what if I had known? What if I had been more open to the idea of working out in a gym and let myself learn that there are fitness centers out there where I could feel comfortable. I surely would have also realized that there are gym memberships that I could have been able to afford back then, too. A sign at Planet Fitness. But I didn’t know these things. I just had a predetermined concept of how these gyms worked and felt very strongly that joining one wasn’t a smart decision. And as I ask around, I realize that I’m not the only person who feels this way. There are some people who tell me they’re afraid not only that they’ll be the only out-of-shape person there, but that they won’t know how the machines work or they just won’t know what to do and where. Let me tell you that I’m happy to have someone to answer these questions for me: my oldest daughter. Kirstin is the daughter of mine who wrote the letter about what it’s like to have a mother who is overweight. She is now a personal trainer at a Planet Fitness gym and she absolutely loves it! Why? Because she works where each member feels comfortable exercising and doesn’t feel as if they are being judged. This is very important to her because she listened to me and understood my fears and concerns about the gym. She now shares that with others who are overweight and it helps them to learn that they are not alone. I find it interesting that she now reminds me that gyms are a great place to work out, especially during the winter months. They are not full of size 3 fitness fanatics, but they do include members who are trying to become healthier and want to start living a more active lifestyle. Hey, that’s exactly what I wish for! Whether you join a gym, belong to a weight-loss support group, exercise at home, or take a daily walk alone or with your best friend, it is awesome! I look at each option as one more step towards a healthier you and a healthier Michigan! 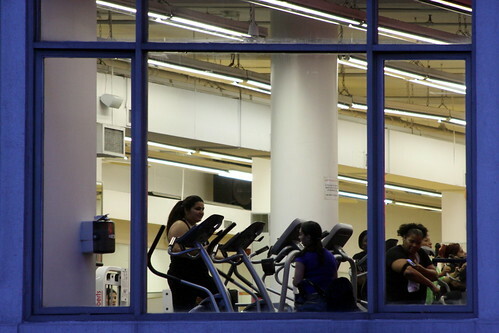 Are you leery of the gym? What’s your favorite way to get in a workout?